Order flowers online same day delivery at a favorable price! ❶ Order flowers online same day delivery and get a bouquet in 2-3 hours! 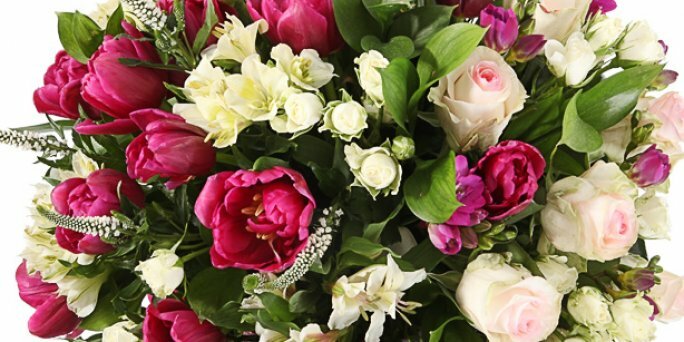 Order flowers online same day delivery and get a bouquet in 2-3 hours! Fast processing of the order flowers online same day delivery. After spending only 5-10 minutes you can choose a fantastic bouquet of the freshest flowers to order online with the delivery to any address in Riga and all over Latvia. Professional florists of studio KROKUS will make a composition in the shortest time, and its own courier service will promptly deliver the bouquet to the specified address. The flowers to order online will be presented to the recipient with your best wishes in just 2-3 hours. You can use our flowers delivery service. The online shop KROKUS welcomes customers on its official website. Here you can find and order flowers online same day delivery in Riga, as well as all over Latvia. Among the advantages of the cooperation it is worth to mark out favorable prices, fast processing of orders, wide opportunities of courier service, a wide choice of flowers and bouquets made of them. An order flowers online for delivery in Riga and all over Latvia has many advantages. Firstly, you can buy a bouquet and present it to your relatives, friends or colleagues without leaving home. Secondly, a large shop range of goods will allow you to choose a composition for any taste and budget. On the third, with the help of our service you can organize a pleasant surprise for the gifted person. Often garden flowers are effectively combined in the compositions with meadow, decorative plants, stylish paper wrapper, bright ribbons. Besides, you can order flowers online next day delivery in the form of bouquets in hatboxes, baskets and even decorative bird cages. At the request of the customer professional florists of KROKUS will supplement the bouquet with a greeting card, sweets in the form of chocolates, pastries "macarons", as well as fruits, berries, balloons, candles, soft toys. Be assured that such a choice of bouquets and gifts you will not find in any shop in Riga and even all over Latvia! Do you want to surprise a loved one, a friend or a girlfriend? Then order flowers online for delivery just on time. In this way you will organize a pleasant surprise for the recipient and give him unforgettable impressions. The courier will bring the bouquet to the specified place at the appointed time and present it to the gifted, conveying your best wishes. How to order flowers to be delivered online in Riga and all over Latvia? To order flowers online with the delivery to the address in Riga or any part of Latvia, use convenient functions of our website. With the help of a special form, specify the place and the time of the presentation of the composition, the specialists of the courier service will undertake the rest of the work. Besides, you can call us at the indicated number and specify all the details of the order with the manager in the phone mode.